Okay, so a new friend over at Jewish Community Foundation passed along the flyer below. Loans to brew craft beer! How awesome. Here’s a link to more information. I’ll be posting the first craft beer debate online later this week. 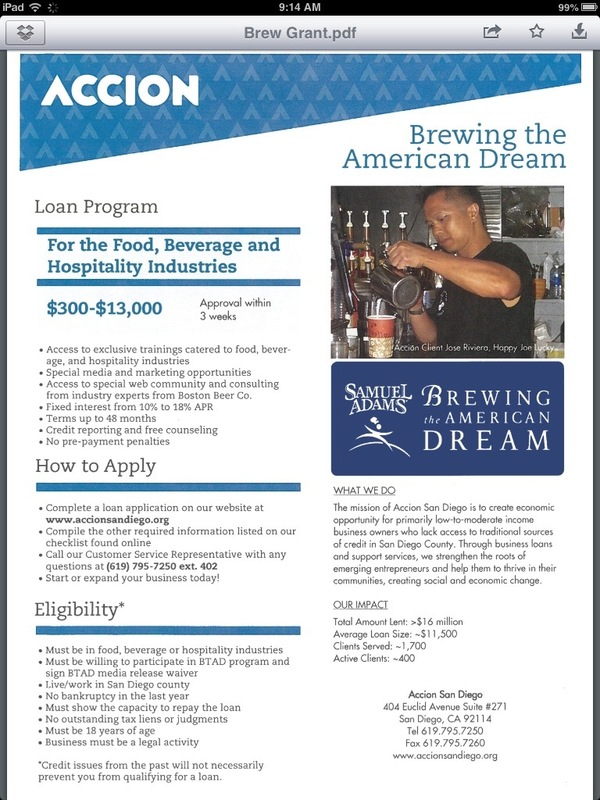 Big thank you to the San Diego Foundation’s new Center for Civic Engagement for making this connection to brewing loans. Please check them out here. A few of the people who came have sent some very thoughtful feedback (and, blessedly, data links) after the event. Sam Ollinger of Bike San Diego said she “appreciated the civility” of the event. The goal isn’t to change minds, but to inform in a fun, civil way. And to enrich the discussion with new perspectives. The following comments came from people who attended the first craft beer debate. “I asked the pro-stadium side if their proposal was really economically viable based on the fact the redevelopment agencies are no longer a source for financing, and the two sites they want to sell have significant constraints including an underground fuel plume and height restrictions. I asked the anti-stadium side if redeveloping the Qualcomm site would be a good way to solve some of our other challenges in the community, such as using it to alleviate the existing pressure on SDSU. And this follow up note: The acreage was mentioned before, but http://www.sandiego.gov/qualcomm/about/factguide.shtml shows the Q at 166 acres. I can’t find a citation for the Sports Arena, but the size used in the debate was 100 acres. 1 acre to 43,560sq ft, 266* 43,560=11,586,960acres (number lower than 12MM based in 166acres instead of 170acres) I’m not in real estate but $30/sq ft for land (located in the middle of desired and developed areas) should be doable… Seems like the $400mm from the NFL/Chargers, plus naming rights/advertising dollars, and repurposing/selling this land should leave a relatively minor shortfall. Very good information, thank you for sending! Great Stadium Debate a Success, what’s next? For those who missed the Great Stadium Debate, not to worry a video of the event will be posted on this site as soon as it’s done. A great time was had by all and most importantly the audience and the panelists had an opportunity to exchange in a more relaxed forum than your typical debate. As mentioned last night, the plan is to follow up with similar debates (provided we find sponsors to help underwrite) on topics ranging from education to water or infrastructure equity and planning. We may even tackle an actual beer topic – mass production versus craft brewing (yes, I’m biased, but the debate could be interesting). We’ll follow the same format of taking a controversial position, having some fun, and providing a forum for people to walk away with information they can share with their friends. The better informed we are as citizens of the region the better our decisions will be–and we’ll be able to have meaningful participation in city and county decisions. And with San Diego becoming one of the premier international destinations for craft beer, this is a great way to open public issues to more people. Thanks for dropping by, please feel free to read some of the background posts! Cheers.